view of the industry. See all the trends and stories unfolding now. With a professional subscription, you’ll unlock a whole new level of insight and productivity.This enables unlimited directory access, as well as premium analytics tools and more. If you’re serious about commercial real estate, this is a must-have tool. Click now to learn more and subscribe. See which investment firms are in the news (and why). Our directory makes it easy to know who the major players are – as well as their investment trends. 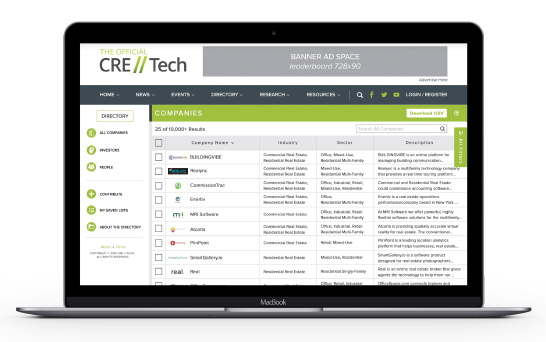 Keep your finger on the pulse of over 75 CRE tech companies, including fundraising activity, media mentions and CB rank. Find out who is in the news (and who is making the news). Our directory showcases the CRE industry’s top influencers, including bloggers, speakers and authors. Own a CRE or tech company? Be sure to claim your listing! Our audience is comprised of tens of thousands of real-estate professionals, so make sure your info is accurate. Want your business to really stand out? 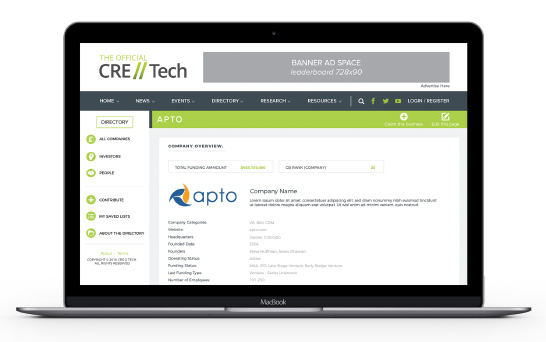 Post company announcements, even advertisements, within the directory and throughout the CRE // Tech website.